Kick off your visit on the 7th (Sun): don't miss a visit to Promenade des Anglais. Get ready for a full day of sightseeing on the 8th (Mon): take some stellar pictures from Colline du Chateau overlook, then take a stroll through Vieille Ville, then get engrossed in the history at Palais Lascaris, and finally make a trip to Place Massena. To find photos, other places to visit, reviews, and other tourist information, read our Nice trip itinerary planner . Belfast, UK to Nice is an approximately 6-hour flight. You can also do a combination of bus and flight; or do a combination of ferry and car. The time zone difference when traveling from Belfast to Nice is 1 hour. Traveling from Belfast in July, things will get a bit warmer in Nice: highs are around 32°C and lows about 25°C. Finish up your sightseeing early on the 9th (Tue) so you can go by car to Saint-Raphael. On the 10th (Wed), make a trip to Site de Malpasset and then make a trip to Massif de l'Esterel. Here are some ideas for day two: stroll around Jardin Bonaparte, then see some colorful creatures with a scuba or snorkeling tour, and then partake in some friendly competition at Esterel Aventures. For maps, more things to do, ratings, and more tourist information, read Saint-Raphael sightseeing tool . Traveling by car from Nice to Saint-Raphael takes 1.5 hours. Alternatively, you can take a train. Plan for little chillier nights when traveling from Nice in July since evenings lows in Saint-Raphael dip to 22°C. Wrap up your sightseeing on the 11th (Thu) to allow time to drive to Marseille. Start off your visit on the 12th (Fri): take in the dramatic natural features at Calanques, contemplate in the serene atmosphere at Basilique Notre-Dame de la Garde, and then take in the waterfront at Le Vieux Port. On your second day here, cruise along Route des Cretes, paddle through the water with a kayaking and canoeing tour, and then take in the spiritual surroundings of Cathédrale La Major. For ratings, traveler tips, maps, and tourist information, use the Marseille trip site . Traveling by car from Saint-Raphael to Marseille takes 2 hours. Alternatively, you can take a train; or take a bus. In July in Marseille, expect temperatures between 36°C during the day and 23°C at night. Wrap up your sightseeing on the 13th (Sat) to allow time to take a train to Avignon. Venture out of the city with trips to Monastery Saint-Paul de Mausole (in Saint-Remy-de-Provence), Carrieres des Lumieres (in Les Baux de Provence) and Roussillon (Le Sentier des Ocres & Tapiezo). There's much more to do: step into the grandiose world of Palais des Papes, make a trip to Pont d'Avignon, head outdoors with Promenade a Cheval La Marisma, and contemplate in the serene atmosphere at Abbaye Notre-Dame de Senanque. To find where to stay, ratings, more things to do, and tourist information, refer to the Avignon online trip itinerary builder . Getting from Marseille to Avignon by train takes about an hour. Other options: drive; or take a bus. In July, plan for daily highs up to 36°C, and evening lows to 20°C. Finish up your sightseeing early on the 16th (Tue) so you can travel to Sarlat-la-Caneda. Kick off your visit on the 17th (Wed): explore and take pictures at Les Noyeraies du Landers, then admire the natural beauty at Jardin Exotique, then explore the historical opulence of Chateau des Milandes, and finally step into the grandiose world of Chateau de Castelnaud. Keep things going the next day: don't miss a visit to Vieux Sarlat, admire the natural beauty at Eyrignac et ses Jardins en Dordogne, and then take in nature's colorful creations at Les Jardins de Marqueyssac. For traveler tips, where to stay, reviews, and other tourist information, go to the Sarlat-la-Caneda road trip planning site . Getting from Avignon to Sarlat-la-Caneda by combination of train and flight takes about 4 hours. Other options: drive; or do a combination of train and flight. Traveling from Avignon in July, you can expect nighttime temperatures to be a bit cooler in Sarlat-la-Caneda, with lows of 17°C. Wrap up your sightseeing on the 18th (Thu) early enough to drive to Carcassonne Center. Carcassonne Center is known for historic sites, museums, nature, nightlife, and zoos & aquariums. Your plan includes some of its best attractions: steep yourself in history at Historic Fortified City of Carcassonne, make a trip to Cité de Carcassonne, kick your exploration up a notch at some of the top local zipline courses and adventure parks, and explore the activities along Lac de la Cavayere. 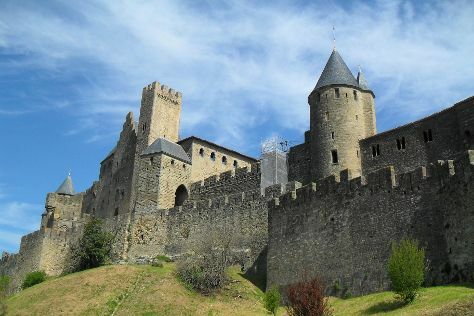 To see more things to do, where to stay, reviews, and other tourist information, use the Carcassonne Center online trip builder . Traveling by car from Sarlat-la-Caneda to Carcassonne Center takes 3 hours. Alternatively, you can take a train; or do a combination of train and bus. Expect a daytime high around 33°C in July, and nighttime lows around 20°C. Finish your sightseeing early on the 21st (Sun) so you can travel back home.